OK. No cactus or succulent here. Just a blurry snapshot. But look closely; those are our two Belgian Tervurens - mama and daughter - Kiani & Osita, speeding around the corner on the way to dinner. Out of the way. Here they come! This is an excellent Aloe for growing in small containers...and with bright sun, it becomes more bronze. You can tell from the photo that we haven't had our "bright sun" season yet. We're still waiting. 'Brass Hat' isn't one of those new introductions which are all the rage; many of them are outstanding and we grow them as well. It is sometimes listed as an Ed Hummel hybrid (grower and creator of many hybrids in the 1960s; Hummel's Exotic Gardens, Carlsbad, California) who created and multiplied many succulent hybrids the old fashioned way. However, it's actually a hybrid created another well known hybridizer, John Bleck. We even know it's heritage: (Aloe haworthioides x Aloe bakeri) X ((Aloe descoingsii x Aloe calcairophila (basically Aloe 'Pepe') X again to Aloe bakeri). There, all you ever wanted to know. Any way, we have just recently added it to our collection and will be adding it to our sales list soon. Aloe 'Blue Elf' is a compact, vigorous grower and is cold hardy to around 20F. These young plants will rapidly grow into an impressive potted plant or, where the weather permits, can even be used as a landscaping ground cover. Like most Aloes, the flowers are very attractive to hummingbirds and occur primarily during the winter. It appears to be one of Edward C. Hummel's hybrids. An easy plant to grow, Aichryson tortuosum is a winter grower, putting out plentiful flowers in late spring. Make that early summer in our climate. Native to the Canary Islands, it's sometimes listed as an Aeonium or even a Sempervivum. It's not hardy. We just added this to our collection. It's Gymnocalycium andreae var. doppianum, and it's not one we've had before. I already like it. A lot. Easy to flower and offsets on offsets! G. andreae is a highly variable species and doppianum is not generally accepted as a variety. Perhaps it could be considered a form, but at any rate, this is that one. These are from leaf cuttings taken three years ago. They're not ready to sell yet but are certainly ready to show off. Today turned out to be a pretty nice day. I wasn't feeling the best earlier on but felt better as the day went along. And today was Portland Parkways in north Portland, a time when a network of streets is closed to all motorized traffic and thousands of people, walking, biking, skating, etc. take to the streets. Our street was part of the network today and, other than a few bikers who felt a need to blast noise from their radios, it was beautifully quiet and pleasant. Of course, when we took Ladybug out for a bit, that drew a small crowd. A cordial welcome to all our new "followers" of the blog from Iraq and New York and even from here in Oregon. I read many of your blogs on a regular basis and always appreciate your input. Just knowing that many of you are stopping by once in a while is a blessing. Welcome! Nothing special tonight. Just a shot across part of one of the greenhouses. Even though it's going to be raining tomorrow, I'll try to get some photos anyway. Peace. This is Echeveria cante, a very nice plant with yellow-orange flowers born on 18" flower stalks. From the mountains of Zacatecas, it was only recently named, even though the plant has long been in cultivation under the name of Echeveria subrigida or Echeveria rosei. The name comes from the Cante Institute and Botanic Garden in San Miguel de Allende, Guanajuato, Mexico where the Charles Glass was curator until his death in 1998. The flowers of this cactus are certainly jaw dropping. Sulcorebutia canigueralii is highly variable in its plant form, but the flowers, wow! For years we've had a plant which was labeled Lobivia 'Easter Bonnet'. Lynn-Marie crossed two of these plants and got these flowers, and the plants are smaller than the Easter Bonnet parents. They were seeded in 1997 and she calls them 'Golden Butterfly'. Recently a person I was talking to referred to these as "just another Jade". Not long after that someone else told me that the Jade was his favorite succulent plant. It's true, almost everyone has grown a Jade or at least seen many of them, sometimes pretty "ratty" ones. Occasionally someone tells me that they can't keep one alive when killing one is really pretty difficult; they either over watered it or let it get too cold. Where we are, Jades are a house plant and can't be used in landscaping. But nicely grown, the humble Jade plant can be an excellent and easy succulent accent plant. Labels: Crassula ovata, Jade Plant, Kara Nursery, Luther Sturtevant. Roxanne, one of the members of the Oregon Cactus & Succulent Society, welcoming people to Fat Plants 2012 this past weekend. The weather cooperated and a good number of people showed up. If you were among those who were there, we thank you and hope you'll return for the July event, July 20-22, at the Stark Street location of Portland Nursery. Thanks to all of you who helped out in one way or another. Back with more plant pictures tomorrow. OCSS Show and Sale, Sat. & Sun. 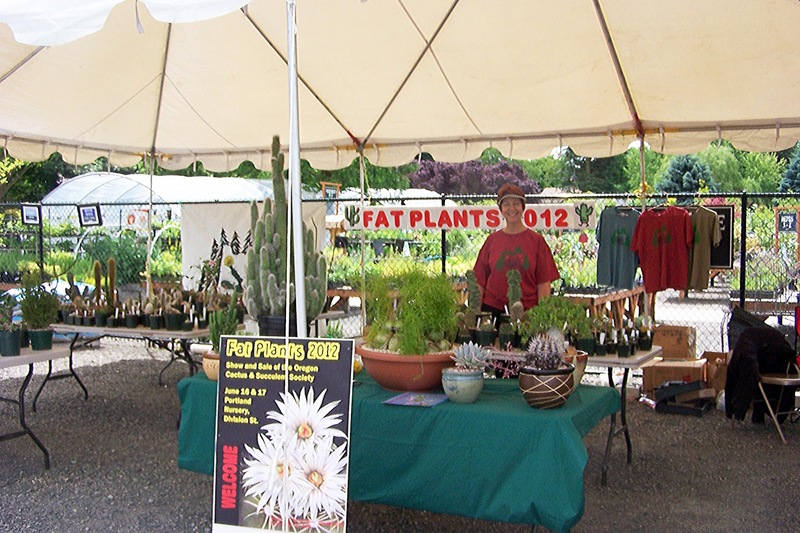 I'll be busy with the June show and sale of the Oregon Cactus & Succulent Society this weekend: Setting up today (Friday) and at the show and sale Saturday and Sunday. If you're in the Portland area, come on by the Portland Nursery on Division Street. This is the well-known "rat tail" cactus, though - in my opinion - it took a lot of imagination to find a "rat's tail" in these plants. Deceptively fuzzy looking on the growing tips, it's not really a "pettable", but, again, it's the prolific flowers which grab our attention. Maybe I can find something of a different color than red tomorrow! Tomorrow? Back to potting up plants for the show and sale on Saturday & Sunday. So many plants have been blooming that it's hard to keep up...or to decide which plant to feature. But this one was so overladen with flowers that I just couldn't pass it by. Like many of the Aporocactus plants, it's a bit wicked to handle, but talk about overcompensating! The hummingbirds are really active right now. I was holding this up to take a picture of it and I almost swatted at a bug buzzing at my ear. Luckily I took my eyes off the view screen on the camera long enough to see that the "bug" was actually a hummingbird, about 2 feet in front of me, taking aim at the flowers. However, when it became aware that I was watching it, it flew away and gave its attention to some other flowers on the deck. The plant I was trying to take a picture of was this: Rebutia albiflora. Enough said. The other day when Lynn-Marie was busy potting plants in the greenhouse she received a visit from one of our neighborly hummingbirds. I immediately went to the aloe flowers. All of this provided for a bit of a diversion in the way of trying to tip-toe between the cactus plants (with a sore back) in order to get a good picture. Well...these are the results. I think she did rather well considering all the difficulties involved. Usually, just as you're ready to take a picture they flit off in the opposite direction. Amazingly, this one found its own way out of the greenhouse without any assistance. I guess I need to go out and take some more pictures! This is just a shot from where I sit when I'm potting or re-potting plants. It's not my main task around here, but both of us get busy in preparation for the local cactus society show and sale. It's next Saturday and Sunday, so there's lots of work yet to do. This lovely little cactus is a cross of Rebutia heliosa and Rebutia albiflora known as 'Sunrise'. The albiflora parentage comes out sometimes as seen below on the left. A very nice, easy to grow. A couple of days ago I may have had my tongue somewhat implanted in my cheek (don't try to translate that!) when I said that the artichoke cactus was easy, if... But, when I say that this is easy to grow, I mean it. It gets a lot of neglect by us throughout the winter and it continues on with grace. Highly recommended. Our greenhouses are not the kind of place where you see row upon row of the same thing. In some ways that would be nice. But no, it's a mishmash of all kinds of succulent plants, the result of 44 years of interest in growing these amazing plants. It certainly keeps things interesting! This is another one of those plants which doesn't need a flower to catch your attention. For this reason it is quite well known. However it has a reputation for being very hard to grow. But it isn't really all that difficult if it is given a dry winter rest and limited watering the rest of the year, bright, filtered sun, and a potting mix with extremely good drainage. The reward: a highly decorative and sculptural plant. The photos were taken by Lynn-Marie. I just posted some pictures of Epicactus 'Clown' not long ago, but when the flowers are there, who can resist? Created, and registered by Phyllis Fleschig of the San Diego area in 1982, this is truly one of the best hybrid Epiphylums to come along in a long time. Yes, this is Mammillaria zeilmanniana in flower, but it's also an old grafted crest. Yes, it also has a couple of normal sections, which will have to be removed later this summer. But...in the meantime, we'll just enjoy the flowers. On the opposite end of the scale from "weird" are the echinopsis flowers. When these bloom it just takes my breath away. I was watering plants in one of the greenhouses today and glanced over to the other side and - whoa! - they were wide open. We've been growing plants like these for over 40 years and they still surprise me. Sometimes we lovingly refer to cacti as "weird" plants, and this one kind of falls in that catagory: long, brightly colored flowers on hairy but prickly columns, which quite regularly creates astounding, crested fans. These pictures don't quite do this flower justice. The orange of the outer petals and the purple edges of the pedals is missing. Sorry. But you get the picture. It's one impressive flower. 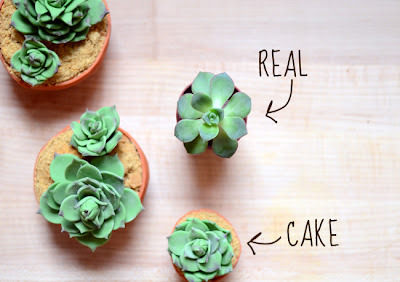 The Pixel Whisk blog has a really cool recipe for succulent cupcakes. I don't have time to do these - and, besides, I have tried making fancy cupcakes without much success - but perhaps someone out there does have the time...I'd be glad to serve as the judge! You just have to be careful to eat the cake and not the Echeveria. I understand this is a relatively new introduction, but I have no information about the developer of the cultivar. 'Chroma' appears to be the correct name, though at least one site lists it as 'Croma'. Whoever developed it, it's a very nice, small growing addition to any Echeveria collection.